I'd call it a New Year's resolution, but those tend to be broken. I prefer to set goals for myself. It just sounds more realistic. Anyway, one of my photography goals for the year is to read at least one book on the art each month. 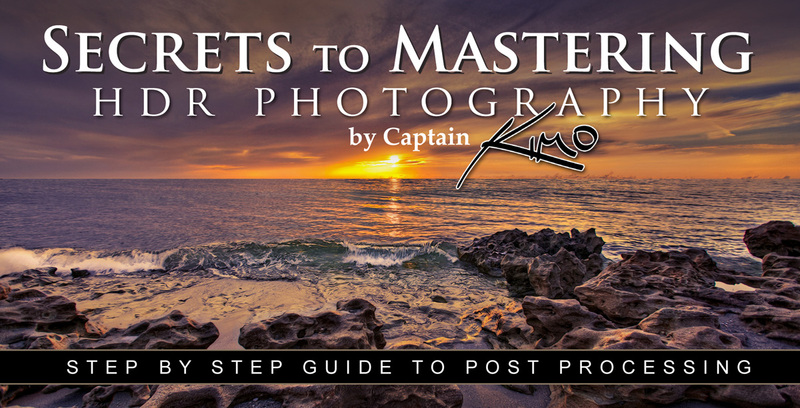 I got off to a good start for the year when Kim Seng, AKA Captain Kimo, asked me to take a look at his new E-book, Secrets to Mastering HDR Photography. I met Kim through Flickr and he has proven to be an inspirational contact. Kim is probably best known for his dramatic HDR landscape shots. There are certain photographers out there with a style that makes one of their shots instantly recognizable. It's a certain way that he or she processes their work that is uniquely personal. Kim is one such artist and in his new E-book he shares some of the techniques he uses to get the "Captain Kimo" look. More than just an E-book, Kim includes a set of bonus material that makes the book more of a hands-on tutorial. It's like a self-paced workshop. Included with the E-book are a set of bracketed exposures, a Photoshop actions file, and several Photomatix settings files. The first part of the book walks the reader through the process of tone mapping the provided bracketed exposures in Photomatix. The various sliders that control the settings in Photomatix can be difficult for HDR newcomers to understand. Kim walks the reader through what is one of the most exhaustive explanations of the various settings that I have seen. He clearly explains what each one does and why he sets things the way he does. Because you have the same image files used in the tutorial, you get to see the effect of the various Photomatix settings first hand as they are applied in Kim's tutorial. This has the added benefit of letting you experiment with different settings on your own, which may aid in understanding Kim's choice of a given setting. After the Photomatix walk-through, Kim offers up 10 tips for HDR processing in Photomatix and Photoshop. These are some practical considerations that go beyond the mechanics of the Photomatix tone mapping process. Topics include the use of light and detail to create images with depth, how to reduce noise, and avoiding the dreaded HDR halos. Another chapter is a brief tutorial that walks the reader through the basics of layer masking in Photoshop. This part of the book is more of a quick and dirty explanation of the process. The reality is that there is more to layer masking than the brief introduction given here. In all fairness, it is a complicated topic that would easily take more pages than this entire E-book to cover thoroughly. Anyone wishing to effectively work in HDR really needs to have a solid understanding of layer masking and an investment in a good Photoshop book would be a wise investment. Something that HDR newbies may not realize at first is that tone mapping an image in Photomatix or any other similar program is only the beginning. A side effect of creating an image with increased dynamic range is that it tends to look flat. Continuing with his workflow on the supplied bracketed images, Kim walks the reader through some common post tone mapping tasks in Photoshop that give life to the image and fix some of the negative artifacts often encountered in tone mapping. Topics such as the correction of minor issues though layer masking and exposure adjustment with Photoshop or Topaz Labs Adjust are covered in a manner that allows the reader to follow along with the sample images. The most useful portion of the E-book to me is a chapter of 10 Photoshop post processing techniques. This is where the real meat of the book is found. These are some "insider" techniques that Kim uses to get certain looks to his images. I learned a number of things from this insightful chapter. The chapter covers such topics as adding detail, smoothing out water in a scene, creating complex layer masks, and dealing with the common problems of halos, ghosting, and blown highlights. One chapter, called "Secrets Revealed", would seem to imply that there would be a lot of detailed instruction. While I found this to be perhaps the most enjoyable chapter to read, it is more demonstrative than tutorial in nature. The reader is shown the original image brackets and the final result, along with some brief background and image capture or processing notes. There is some enjoyable reading here, kind of what I have come to expect in something like a typical "coffee table" instructional book. Kim applies what you have learned throughout the book and you get to see what is possible with a given set of bracketed exposures, but without the exhaustive detail given to the post processing of the sample images in earlier chapters. I really enjoyed reading Kim's E-book. It is great that he is so willing to share his techniques in explicit detail. A lot of talented photographers out there tend to keep their best post processing secrets closely guarded, with the possible exception of an expensive workshop. For the price, you get a lot of practical information that you can use immediately. The information provided would easily take up a 2 day workshop, making this E-book an absolute bargain. The manner of presentation makes this book suitable for both beginner and advanced HDR photographer alike. It should be noted that to take full advantage of Kim's lessons, you should at the very least have a copy of Photomatix and Photoshop CS4 or CS5. It would be very helpful to have the Topaz Labs bundle as well, as Kim relies on this reasonably priced suite of software for a number of post processing tasks. I can honestly say that I highly recommend Kim's E-book. The low price makes it a no-brainer investment in your HDR post processing skill set.